The Alec Bradley Black Market is a hand-rolled premium cigar that contains a rich combination of Honduran and Panamanian tobaccos. A dark, oily Nicaraguan wrapper is used to hold these aged tobaccos together, and once ignited, produces a thick creamy smoke that stimulates the senses with a perfectly balanced combination of spice, pepper and rich citrus flavors. 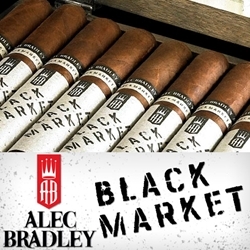 Alec Bradley Black Market premium cigars have become one of the company’s most popular cigars earning a 90+ ratings amongst cigar publications and connoisseurs everywhere. Smokers Discounts can bring Alec Bradley Black Market premium cigars right to your front doorstep. We’ve made it easy and affordable to buy these hand-rolled cigars online. A variety of sizes and flavors are listed below in our online cigar store. Each of these styles are in stock and available today for a low discount price. Call us for more details!